Probashbangla24 online Desk : An existing antibiotic may selectively kill dangerous cells within melanoma, the deadliest type of skin cancer, a study claims. 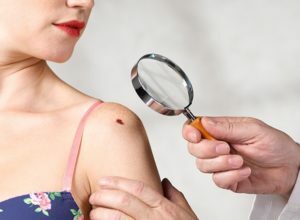 The research, published in the journal Cell Chemical Biology, found the drug, called nifuroxazide, showed promise for complementing existing melanoma therapies. Researchers at the University of Edinburgh in the UK tested the drug’s effect on melanoma cells in mice and samples from human tumours. They caution more research is needed to determine if it will be effective in people. The researchers hope that the strategy may complement existing melanoma treatments, called BRAF and MEK inhibitors. Currently, some people’s tumours develop resistance to BRAF and MEK inhibitors and the researchers found that some of these resistant tumours were high in ALDH1. In the lab, the researchers simulated this by treating cancer cells lines with BRAF and MEK inhibitors, which increased the number of cells with high levels of ALDH1 and made the cells especially sensitive to nifuroxazide treatment. “We’ve shown this antibiotic that’s used mostly to target intestinal bacteria can also target and kill cancer cells high in the enzyme ALDH1,” said Liz Patton from the University of Edinburgh. “It’s great that this antibiotic is approved for use in humans, but it wasn’t designed as a cancer drug, so we still need to find out if it’s safe and effective for cancer in humans — for example, can it get to the cancer in the body and are the doses needed safe,” said Patton. “We may need to take the concept for how this antibiotic works and re-design it to make it better at killing cancer,” Patton said.